I mean … America has been leading the crusade against all forms of jihad and terror and Al Qaeda and all things radically Islamic, and while Uncle Sam’s ‘war on terror’ may have been a miserable failure in terms of decreasing the actual amount of terror in the world, at least we’ve always known who the good guys and the bad guys are, and I thought for a moment that Obama was going to arm those crazy extremists! Here’s the truth people: the term ‘moderate’ when applied to the violence in Syria is a piece of meaningless fiction. Moderates live alongside the Jabberwocky, hidden somewhere in the borogoves! I’m not even sure what the term ‘moderate’ is supposed to signify! I can’t imagine that it’s intended to mean that these people kill their enemies in a more moderate way – with a scouting knife perhaps rather than with a gun. It certainly doesn’t mean that they don’t commit atrocities. No party in the Syrian conflict has a squeaky-clean record in that regard. Is it meant to signify that these people make a principled distinction between civilians and combatants? Not a chance! My guess is that the term ‘moderate’ is supposed to refer to the belief system of the killers in question. The ‘moderate’ rebels are the less ideologically driven fighters. While their ‘extremist’ counterparts are motivated by extreme religious zeal, moderate rebels kill people simply because it’s their job, or perhaps they do so out of love of country – a moderate love of country, at any rate. 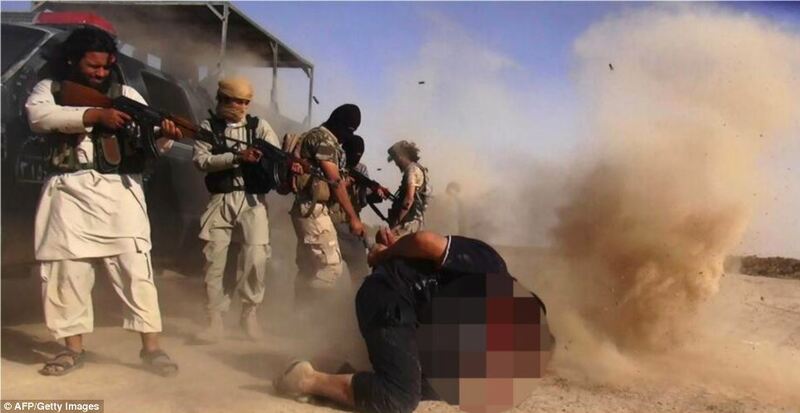 Islamic State of Iraq and the Levant militants executing members of the Iraqi forces on the Iraqi-Syrian border. Actually no … actually, I don’t think my killer’s motivation would make any difference to me at all, and I truly can’t see that it really makes a man more moderate if it’s his love of money that drives him to kill rather than a perverted love of God! Besides this, I’ve spoken to a number of Syrians who actually fought with these extremists and each of the guys I spoke to had initially joined because they were poor and needed a job. I’m not at all convinced that all the religious extremists really hold extreme religious views. Conversely, I’ve got no reason to believe that there aren’t any number of extremely religious people amongst the moderates! It’s all very confusing and the words do look increasingly meaningless. Indeed, from what I can work out, the only difference between the moderates and the extremists as identifiable groups is that the moderates are the group that the US and its allies support (at the moment) and the extremists are the ones that we don’t support. The moderates are just as extreme in their violence as those we condemn and oppose, and I’m pretty sure that they are just as religious or irreligious as killers. The term ‘moderate’ then translates simply as ‘someone we support’, in contrast to the people of Syria who made it abundantly clear in their recent election that they don’t support the rebels at all – moderate or otherwise! Perhaps the term ‘moderate’ is also meant to indicate that these fighters are friends to the US and her allies and will not turn and bite the hand that feeds them. If so, then we’re dealing with another fiction. Mr Obama would have to be completely stupid to believe that the jihadist rebels he supports today won’t turn on him tomorrow. I don’t think Mr Obama is that stupid. Indeed, I think he knows full well that the moderates he supports today may become tomorrow’s extremists who will need to be targeted themselves by another group of moderates (who could quite possibly be today’s extremists if circumstances change)! That’s it! I’m giving up on the term ‘moderate’. Instead I’m going to focus on making sense of the word ‘democracy’ as used in the sentence “Mr Obama is bringing democracy to Syria by overthrowing the candidate that 88% of the Syrian people voted for”. Father Dave is the Anglican Parish Priest, former professional boxer, community worker and agitator living in Australia. The bloodshed in both Syria and Iraq is carried out by Western Crusaders and not so-called “jihadis”. No Muslim in right mind will like to die for the Zionist-dominated United States. But then….. Long live “Islamophobia”….